A storage node contains the immutable key and its associated value. Definition at line 89 of file Sawyer/Map.h. Key part of key/value node. Returns the key part of a key/value node. Keys are not mutable when they are part of a map. Definition at line 98 of file Sawyer/Map.h. 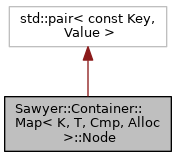 Referenced by Sawyer::Container::AddressMap< rose_addr_t, uint8_t >::changeAccess(), Sawyer::Container::AddressMap< rose_addr_t, uint8_t >::checkConsistency(), Sawyer::Container::IntervalSetMap< I, S >::erase(), Sawyer::Container::IntervalMap< Interval, int >::erase(), Sawyer::Container::IntervalMap< Interval, int >::findFirstOverlapImpl(), Sawyer::Container::IntervalSetMap< I, S >::getIntersection(), Sawyer::Container::IntervalMap< Interval, int >::greatest(), Sawyer::Container::IntervalSetMap< I, S >::insert(), Sawyer::Container::IntervalMap< Interval, int >::insert(), Sawyer::Container::AddressMap< rose_addr_t, uint8_t >::keep(), Sawyer::Container::IntervalMap< Interval, int >::least(), Sawyer::Container::AddressMap< rose_addr_t, uint8_t >::prune(), Sawyer::Container::AddressMap< rose_addr_t, uint8_t >::read(), Sawyer::Container::AddressMap< rose_addr_t, uint8_t >::traverse(), Sawyer::Container::IntervalMap< Interval, int >::upperBound(), and Sawyer::Container::AddressMap< rose_addr_t, uint8_t >::write(). Value part of key/value node. Returns a reference to the value part of a key/value node. Definition at line 105 of file Sawyer/Map.h. Referenced by Sawyer::Container::AddressMap< rose_addr_t, uint8_t >::changeAccess(), Sawyer::Container::AddressMap< rose_addr_t, uint8_t >::checkConsistency(), Sawyer::Container::DistinctList< size_t >::erase(), Sawyer::Container::IntervalMap< Interval, int >::erase(), Sawyer::Container::IntervalSetMap< I, S >::existsAnywhere(), Sawyer::Container::IntervalSetMap< I, S >::existsEverywhere(), Sawyer::Container::IntervalMap< Interval, int >::get(), Sawyer::Container::IntervalMap< Interval, int >::getOptional(), Sawyer::Container::IntervalMap< Interval, int >::getOrDefault(), Sawyer::Container::IntervalMap< Interval, int >::getOrElse(), Sawyer::Container::IntervalSetMap< I, S >::getUnion(), Sawyer::Container::IntervalMap< Interval, int >::insert(), Sawyer::Container::IntervalMap< Interval, int >::operator(), Rose::BinaryAnalysis::Partitioner2::AddressUsageMap::overlapping(), Sawyer::Container::AddressMap< rose_addr_t, uint8_t >::read(), Rose::BinaryAnalysis::Partitioner2::AddressUsageMap::spanning(), and Sawyer::Container::AddressMap< rose_addr_t, uint8_t >::write(). Definition at line 106 of file Sawyer/Map.h.